Credit to the Dogs who fought bravely and played an attacking brand of footy but were blown away in the last term and Sydney win with their highest score in five seasons and stay top of the table. BEHIND SWANSMcGlynn drags his shot wide with one second remaining and the final margin will be 82 points. GOAL SWANSShaw drives the pass in to the pocket and Jetta wins the free as he has his arms chopped in the marking contest. A sublime drop punt from tight in the pocket and it is now 81 points! GOAL SWANSJack hits Roberts-Thompson out in front inside 50 and LRT guides the kick to Mumford who marks just 20m out. 'The Mummy' boots his third of the day. 13 goals kickers for Sydney. Under three minutes of game time to go and the Dogs have shown some promising signs with their attacking football although they will be beaten by a large margin. GOAL SWANSKennedy has pushed forward and found an acre of space as Shaw hits him overhead. He is a fantastic set shot and he bags his 14th goal of the year. Swans by 69. GOAL SWANSJong accidentally knocks it over the line on the full and McVeigh will take the free kick. From the boundary line, he drop punts through a stunning goal. The Swans are out by 63 points. GOAL DOGSA sensational goal from Giansiracusa as he is able to collect the ball deep inside forward 50, spins out of trouble, evading the tackle and then snaping through the major! GOAL SWANSRoberts-Thompson hands out to McGylnn who breaks the tackle and then gives it over the top to Hannebery and he knocks home the major - a Red and White tsunami! Flood gates are open. GOAL SWANSMcGlynn gathers on the bounce, falls to ground but then gets to his feet and drives the kick to full forward where Morton, the super-sub, marks and boots his firs goal as a Swan. 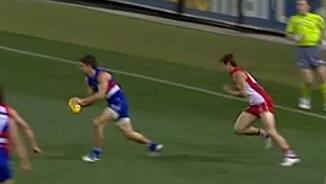 Mike Pyke was the Swan who made way for Morton after coping a knock to his left ankle in this final quarter. BEHIND SWANSParker unloads with a monster bomb from outside the paint, he strikes it well but it doesn't bend back enough. BEHIND DOGSLake takes a great mark but then shoots at goal and misses to the right from 45. GOAL SWANSTransition footy at its best from the Swans as Morton gets involved again after marking the Bird pass, he fires the handball out to Hannebery who steadies and drills a lovely major. GOAL SWANSMorton, who has just been subbed on, has an immediate impact as he dishes the handball over to Goodes who steams in and bananas through another one for the Swans! His third. GOAL SWANSMcGlynn chips a pass in to the right forward pocket to find O'Keefe on the lead. He drop punts it from 30 out close to the boundary and that is a superb kick - sublime. The Swans will come away with the four points today but will need to have a look at the tape during the week as they can illafford to allow teams to score this heavily during finals. GOAL DOGSAddison bags his fourth of the afternoon as he makrs at CHF, plays on and rides home a fantastic major. He has played a great game. 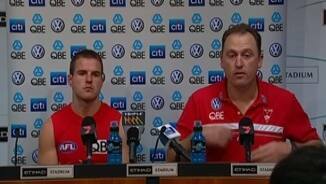 Swans by 33. BEHIND DOGSGia drives the shot at goal from tight in the right pocket and has the ball rished over for a minor score. GOAL SWANSRoberts-Thompson is able to gather the ball deep in attack, he fires it out to Goodes who runs around and pumps home the goal as Jong is helped off the field after a knee to the back. The final quarter is underway and the Swans will be looking to finish strongly. The Dogs need to fight the game out. Some champagne football from the Swans in that term as they add another six goals to their score, the Dogs boot three, Griffen registers a careerhigh 38 touches and the Swans lead by 34 at 3QT. 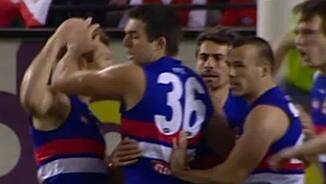 Cooney was subbed on midway through the term and Cordy was given the red vest for the Dogs. GOAL DOGSSmith to Murphy on the overlap through the centre and Murphy drills the pass to Giansiracusa. Gia jabs the short pass to Addison. Addison jogs inside 50 and threads through his 3rd. BEHIND DOGSCross unwinds from 45 out and it shaves the post for a minor score. Swans lead by 40. GOAL DOGSThe Dogs head to full forward and Addison out the back of the pack takes the chest grab as the ball flies over the heads of all other players. Can't miss from there. Dogs get one back. BEHIND SWANSGoodes on the lead takes a brilliant diving grab. He strikes it hard and tugs it right for a minor score from 50 out. GOAL SWANSJack gathers possession on the wing and sends the ball inside forward 50, Reid pushes off Lake as the ball bounces passed, he turns, gathers, runs in and snaps through his second. GOAL DOGSHiggins gives to Dickson and he snaps through his third and the Dogs first goal since the 10th minute mark of the second quarter. Swans by 40 points. GOAL SWANSJack shoots the handball over the top to a running Jetta who fires the pass to full forward where Roberts-Thompson takes the mark. LRT with number three! Brilliant ball movement, Sydney. GOAL SWANSGoodes with a superb tackle on Higgins as the ball spills out of his hands, Parker roves it well and slams home another goal for the Swans and it is starting to get ugly for the Dogs. BEHIND SWANSBird snaps from 30 out and hits the post and lets the Dogs off the hook. BEHIND SWANSRoberts-Thompson leads in to the left pocket and leaps to clunk a strong mark overhead. From 20m out, he pulls it wide and sneaks it in for a behind. BEHIND SWANSJack gets the handball from Reid, launches a lovely long kick from 45 but strikes the post. BEHIND DOGSMinson wins the centre clearance as he drives the kick inside 50 and Skinner leaps to bring down a great mark. Unfortunately, he fails to cap off his good work. GOAL SWANSJack wins the ball off hands in the left forward pocket, steadies and with a beautiful drop punt, steers it through from the tight angle and extends the Swans' lead out to 32 points. GOAL SWANSGoodes takes the intercepting mark in the middle, looks up and finds Pyke inside forward 50. From 45, it's not pretty off his boot but it floats through for his third! GOAL SWANSSmith with a lace-out pass inside attacking 50 to hit Goodes on the chest about 40 out with little angle to speak of. He strikes it to perfection and thumps it home. Swans out by 20. 3rd quarter underway after Sydney really upped its intensity in the second term and turned an 18point quarter-time deficit in to a 14-point HT lead. Will the Dogs fall away or continue to fight? A sevengoal to two quarter in favour of the Swans who have found a spark and they take a 14-point lead at half time in a free-flowing and high-scoring affair. The Dogs are not out of this contest. BEHIND SWANSA minor score to the Swans and the margin now stands at 14 points. GOAL SWANSSydney wins the centre clearance as Pyke knocks it forward to Roberts-Thompson who turns his man, bends down to collect the footy and snaps through his second. Swans by 13. GOAL SWANSO'Keefe takes possession deep in attack and according to the umpire, is driven in the back by Murhpy - harsh. 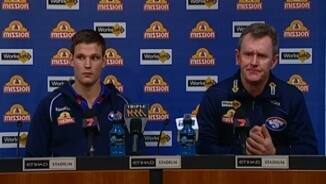 O'Keefe makes no mistake but the Dog fans voice their disapproval. Griffen is up to his 24th possession11 handballs and 13 kicks - and has been fantastic. The game is being played at a break-neck speed. GOAL SWANSPyke guides the kick to the hot spot from half forward and Mumford has his arm held and wins the free. From dead in front, he bags the Swans' third consecutive goal and they lead! BEHIND DOGSDjerrkura dances through a tackle and then snaps at goal but it floats wide for a behind. BEHIND SWANSJack fires at goal from 50 but it comes off hands and goes through for a behind. GOAL SWANSMarkovic turns the ball over coming out of defence, Malceski gathers and sends it inside 50 where Reid is loose, he takes it on the bounce, steams in and pops it home. Here they come! GOAL SWANSHannebery dishes it inside to Jack who gives it off to McGlynn and the former-Hawk unwinds from just inside 50 and nails a fantastic goal as the Swans close the gap again. GOAL DOGSDickson with a brilliant handpass out of the congestion and inside to Johannisen who takes possession and snaps it home from directly in front! Dogs continue to answer. GOAL SWANSMalceski drives the pass forward and in to the left pocket where Mumford stands strong to clunk the overhead mark. He nurses it home with a fine set shot from 45 out. Dogs by 11. GOAL DOGSGriffen, who is playing like a man possessed, wins the free at CHF and with a booming pass picks out Picken, who has broken free at full forward and he takes the chest grab. GOAL! GOAL SWANSGoodes swings the pass inside 50 out in front of Roberts-Thompson who gathers the ball on the half volley, turns, breaks the tackle and snaps on his right boot for a great goal! BEHIND SWANSThe Swans on the fast break down the wing as Goodes moves it on to Bird who gathers and sends it to Roberts-Thompson inside 50. He drags the shot right. Back for the second quarter and the Swans have a task on their hands, harder than most would have expected, if they are to maintain top spot on the AFL ladder tonight. The siren sounds to end an entertaining term as the Dogs register their best first quarter of the year and the Swans concede their heaviest opening quarter score for the season. Dogs by three goals. The Dogs are playing inspired football and are taking it right up to the Swans as Griffen gathers his 15th disposal of the term. BEHIND DOGSGriffen, with his 13th disposal, unloads from 55 out but drags it wide for a minor score as it is knocked through. GOAL DOGSHiggins drives the pass to the top of the square and Malceski bumps Cordy out of the contest and gives away the free - two actions. Cordy pumps home the Dogs' sixth goal! They lead by 17. BEHIND DOGSDjerrkura collects the footy inside 50 and is taken high by Shaw and wins the free. From 35 and directly in front, he sprays the shot to register the Dogs' first behind. GOAL DOGSHiggins gathers hard up against the boundary line and dishes it inside to Giansiracusa who snaps it along the ground, it bounce over McVeigh and through for a superb major! Five straight. GOAL SWANSGoodes floats an up-and-under kick inside attacking 50 and Pyke reads it best to clunk the uncontested mark. He lines up from point-blank-range and wobbles it through for his 2nd. GOAL DOGSBoyd fires the pass to full forward where Lake attempts the grab, it spills to the ground and Addison crumbs it beautifully and dribbles through a lovely goal from tight in the pocket. GOAL SWANSGoodes, from 50, decides to pull his kick and heads for Reid who takes the ball on the bounce and hooks it in to the goal-square where Pyke takes the contested grab. Pyke goals. BEHIND SWANSJack turns and jabs the pass inside forward 50 to Reid who marks 45 out. He hooks it a little from outside the arc and it sails through for a minor score. BEHIND SWANSA ball-up at the top of the Swans' goal-square and the Dogs usher it over the line for a rushed behind. A fast start to this contest and the Dogs have jumped out of the blocks. High intensity and good pressure from both sides. GOAL DOGSMcVeigh oversteps the mark after Dickson to the grab at half forward and the umpire awards the 50m penalty. From 15m out on a slight angle, Dickson pops it home and the Dogs lead by 12. GOAL DOGSDickson gathers the footy at half forward, turns and lets it rip from just inside the arc and it sails through for a great goal as the Dogs regain the lead. GOAL SWANSKennedy shoots the handball over the top and out of the congested pack to McGlynn who takes possession, runs in to space and fires home the superb goal from 40. GOAL DOGSGriffen spears the direct pass to full forward to spot Lake right in front of the sticks. Beautiful kick. Lake knocks it through for the perfect start for the Doggies. The Dogs have lost their past eight matches by an average of 59 points, while the Swans had their ninegame winning streak broken last week by the Magpies. I can't see an upset today. Here we go. Welcome to Etihad for the clash between the Swans and Dogs. The Swans will secure top spot if they can claim the four points here this afternoon. No late changes and the subs are Cooney and Morton.